In our ever lasting quest to find true secular growth stories we keep finding stories outside the US. All 3 companies mentioned at the beginning of this Investors's Business Daily story have interesting opportunities ahead of them, but let's focus on SmartHeat (HEAT) for today. While there is nothing ground breaking about the company, as we often say - you are getting a second chance to buy in the type of companies that prospered in the US in the 1950s/1960s as the world modernizes. As you can see this $500M market cap company has caught the attention of some portion of the investment world since its most recent earnings release on the 16th of November. SmartHeat Inc., which makes energy-savings products in China, said Monday its third-quarter profit nearly more than doubled as the growing Chinese construction industry boosted demand for its products. The company also affirmed its full-year profit guidance and said it continues to expect earnings growth "well into 2010." The company said it earned $8.9 million, or 36 cents per share, in three months ended Sept. 30. It earned $4.3 million, or 18 cents per share, in the same period last year. Sales climbed 83 percent to $37.8 million. The company said sales across all of its product lines grew during the quarter, with 43 percent of sales coming from its heat supply line thanks to a boost from growth in the Chinese domestic construction industry. Analysts surveyed by Thomson Reuters expected a profit of 38 cents per share on $35.1 million in sales. The company also said it continues to expect a 2009 profit of $15.5 million, which amounts to about 62 cents per share. It expects $80 million in sales. Analysts expect 59 cents on $78.6 million in sales for the year. A "Green" Technology Company: China is a country that derives the majority of its heat energy through burning coal. Massive air pollution is created due to inefficient coal burning. As the developer of 6 key patents across our product lines, SmartHeat's plate heat exchanger (PHE) technology and products help reduce fossil fuel related costs and pollution by capturing and recycling waste heat thereby producing less CO2 emissions. ....valuation is so old school. It has all the right "code words" that make speculators salivate.... China... clean energy.... oh baby, the heat is on! China's heat transfer market is currently estimated at approximately $2.4 billion with double-digit annual growth according to China Heating Association. Among other things, 2009 may be remembered as the year China's pollution-control industry came of age. 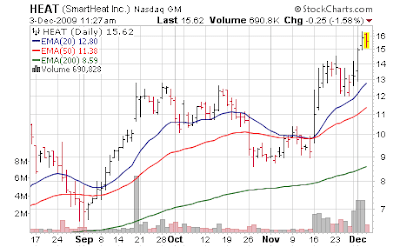 Back in May, SmartHeat (HEAT) migrated to the Nasdaq from a lesser exchange, followed a few months later by Rino International (RINO), which makes pollution control equipment. At the same time, water treatment equipment maker Duoyuan Global Water (DGW) pulled off a successful IPO. The market for such firms is huge, said Rodman & Renshaw research director Joe Giamichael in an e-mail to IBD from China. "The energy-conservation, pollution-reduction opportunity in China is tremendous," he wrote. "As I speed through Qingdao in a cab writing this I am in my fifth major city in two weeks, all equally gray-skied with extremely poor air quality." SmartHeat is attacking one aspect of the problem: heating systems. Most of China's buildings currently house coal-burning boiler systems using shell-and-tube heat exchangers that were "state of the art in 1930," says analyst Greg Garner of Singular Research. SmartHeat's plate heat exchangers, standard in the West but new to China, are more than twice as efficient as the old technology. They transfer heat between fluids without allowing the fluids to mix. Individual PHEs are sold to power utilities and certain industries such as chemical processing. Entire PHE systems, involving pumps, valves and control systems, are installed in buildings for climate control. The China District Heating Association estimates that Chinese PHE sales are growing 30% a year, while PHE system sales are gaining 70% annually. Analyst Garner admits to some skepticism that the numbers are really that high, but he agrees the market is growing rapidly. He points to the lack of price competition, even though there are so many rivals that SmartHeat leads the field with just 9% market share. "(SmartHeat) prices the end product based on the raw-material costs," he said. "Any pricing pressures are minimal." Government policy is a key factor in that growth. China's $586 billion economic stimulus package, passed late last year, includes $31 billion for energy efficiency. On Nov. 25, the government doubled its planned investment in environmental protection to $454 billion by 2015. New regulations are also mandating another piece of equipment that Americans take for granted: heat meters. Traditionally, when businesses and residents leased buildings owned by the government, which is a lot of them, the heat was simply included in the rent. The government eventually realized how wasteful this was and in 2003 mandated that all new buildings include heat meters. Last year, it expanded the law to retrofit older buildings. The market is so new there are no data on its growth. But analysts agree it's a big opportunity for SmartHeat. Garner points out that in the most recent quarter the firm reported $7.8 million in heat-meter sales, while all of 2008 brought in only about $500,000. Now typically I prefer investing in something with a much wider moat around its business... there is nothing proprietary here. But with anything in China you basically are buying a market opportunity. So far, these are the seven-year-old company's only product lines. Analysts say there isn't much to differentiate its products from other firms' since PHEs and heat meters are fairly uniform. SmartHeat It has some 250 customers in all, none providing more than 8% of sales. SmartHeat is also moving to vertically integrate. Since 2004, it's been getting the plates for its PHEs from Denmark's Sondex, making it one of Sondex's three distributors in China. But last June, it bought Siping Beifang Heat Exchanger Manufacture Co., which can make the plates for SmartHeat in-house. "In our view, SmartHeat's plan to vertically integrate is a wise business decision, reducing lead time and manufacturing costs, and seems inevitable," he wrote.